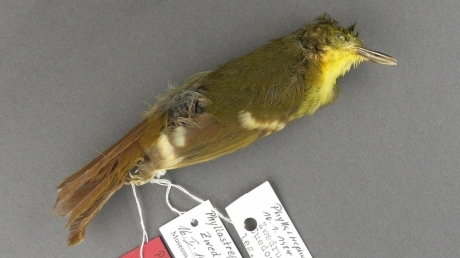 The Liberian Greenbul has long been one of the world’s most poorly known bird species and was listed as Critically Endangered up until 2016. “The Liberian Greenbul has gained almost ‘mythical’ status since it was sighted in the ‘80s, says Professor Martin Collinson, a geneticist from the University of Aberdeen’s Institute of Medical Sciences. The Liberian Greenbul was seen on nine occasions between 1981 and 1984 in the Cavalla Forest in Eastern Liberia. The only known specimen was collected in January 1984 and described as species ‘new to science’. The study was carried out in collaboration with scientists from the Zoological Research Museum Alexander Koenig (Bonn, Germany), Senckenberg Natural History Collections (Dresden, Germany) University of Cambridge and BirdLife International. The Liberian Greenbul 2013 Expedition was supported with funding from the RSPB and the African Bird Club.